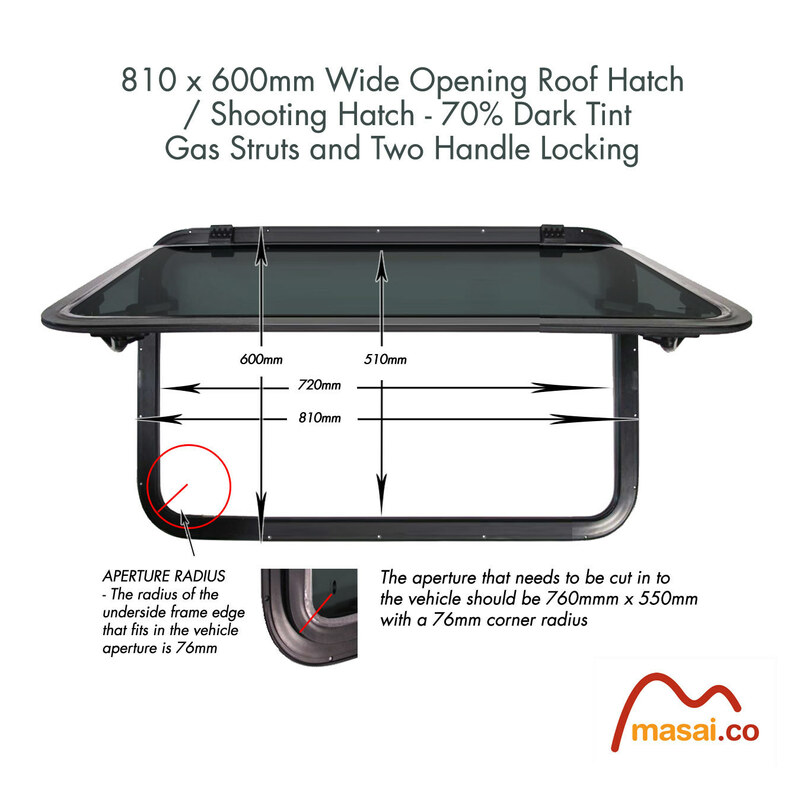 Vehicle Sun Roof / Wide Opening Roof Window / Vent / Shooting Hatch / Deck Hatch – use where increased access, light and ventilation is needed but not at the expense of security. Our vehicle Roof windows feature E43 Toughened Glass with Aluminium Frame, they are Wide Opening with Gas Struts and Lock, 70% No-light transmission dark tint. Although designed for the roof of vehicles they can also be fitted as a Side Window, but you will need to carefully drill small drain holes into the bottom of the aluminium frame to discharge water. Variety of uses where increased access, light and ventilation is needed but not at the expense of security. Although it is designed for the roof of vehicles it can also be fitted as a Side Window, but you will need to carefully drill small drain holes into the bottom of the aluminium frame to discharge water. Includes Internal Bezel Trim (aluminium L section 20mm x 20mm, black powder-coat paint). This bezel can be used as a template to cut out the aperture. Once you have cut the correct shaped aperture, you will need rivets and silicone sealant to attach the window.